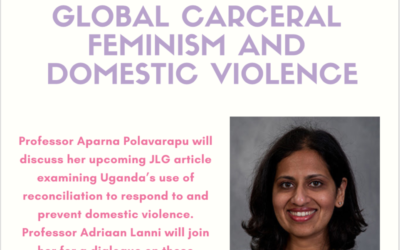 ROLC Core Faculty Professor Aparna Polavarapu will be lecturing today at Harvard University on the effects of global carceral feminism and how Western ideologies have influenced international human rights ideals. She will speak on her research regarding reconciliation and other restorative justice mechanisms in Uganda, and how these concepts can be incorporated in Western approaches to justice. This event is hosted by the Harvard Journal of Law & Gender and the Global South Dialogue, with funding from the DOS Grant Fund. Learn more about the event here.